It is thought the family were relatively wealthy and of high status. Mr Smith and Mr White called Sussex Police as soon as they uncovered the items in October 2008 as they were unsure of the age of the grave. Mr White said: "It was a bit scary at first because we were unsure if it was a murder scene." 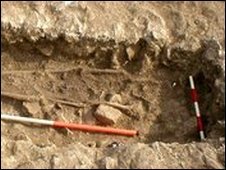 Casper Johnson and Greg Chuter, East Sussex County archaeologists, confirmed they were Saxon burials and decided to excavate the graves immediately to avoid the risk of looting. The most impressive grave contained the remains of a female, an unusual bronze bowl, gilded brooches and silver belt decorations. The male was buried with a spear and shield. The 1,500-year-old skeletal remains and the relics have been sent to English Heritage's laboratory in Portsmouth for analysis. It is hoped they will eventually go on public display at Lewes's Barbican House Museum. English Heritage said the site was being protected as a scheduled monument. 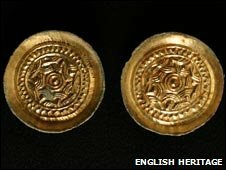 Paul Roberts, of English Heritage, said: "Our understanding of the graves is considerably better for the careful and exemplary approach taken by the two local metal-detectorists who discovered the site and its subsequent excavation by county council staff and unpaid local archaeologists." East Sussex County Councillor Matthew Lock said: "Our archaeological section is working hard to make sure that the archaeology in East Sussex is understood and cared for. "To do this effectively they need the help of keen people like Bob and Cliff, who not only behaved very responsibly by reporting their marvellous discovery, but were of great help in assisting our archaeologists and guarding the site whilst it was being excavated." Under the terms of the Treasure Act the pair could be entitled to a reward, but Bob said : "Mine and Cliff's name will go down in the history books. "To find the unknown is reward enough. That's priceless."